3.Extra USB Function: Charge your phone when playing music, no worry about phone power off along your journey. This professional version also support play music from USB stick. 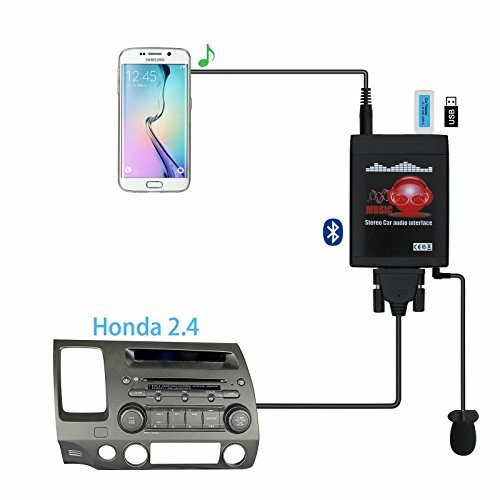 4.Support 3.5 mm AUX Input: Standard 3.5 mm AUX input, you can enjoy music from all AUX possible device, like MP3 player, Mobile Phone, PSP, MP4, etc. 5.Plug & Play: Installed via OEM CD changer port, integrated with the car. a.Fits Accord premium 6CD Radio ,Acoord single CD radio ,Accord 6 CD radio . Built-in bluetooth 4.0 and Build-in high performance mic and clip-on design, for your clear hands-free calling and safe driving. Not compatible with Navigation,DVD and Touch Screen radios. If you have any questions about this product by Yomikoo, contact us by completing and submitting the form below. If you are looking for a specif part number, please include it with your message.